Miles Traveled: 312 round trip. 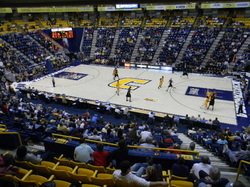 McKenzie Arena is home to the Chattanooga Mocs basketball team. The arena sits 10,928 fans, features two levels and one concourse connecting them. Both levels feature chairback seating. The lower level contains two sections. The 100 level seats are retractable and are blue. This level has the band and student section. 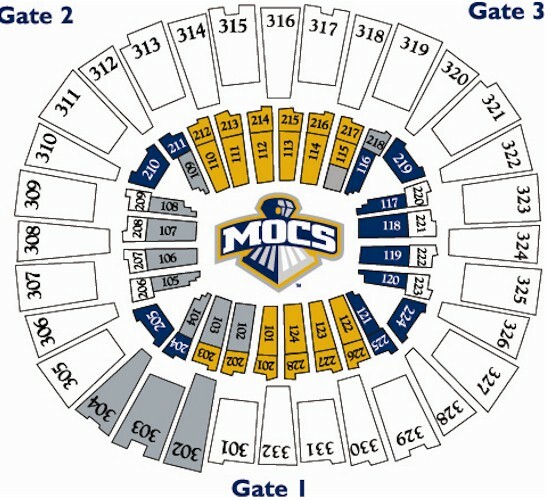 The band and students seats range from section 102-108 and can be found in the upper deck if needed. The student section is known as the "Moc Maniacs." The 100 level is not a complete bowl due to the four entrances to the court. The 200 level features permanent seats and are yellow. The 200 level is also known as the "Gold Circle". The upper-level has blue chairback seating. The second level hangs slightly over the first level. This level features two video boards located in sections 305 and 321. The concourse contains several concessions stands and restrooms. TVs are located at each concession stand and a TV at each entrance. This concourse services both levels of the arena. The concourse features several men and women basketball players on the entrances before the vomitories and past Moc team photos are hanging on the walls. The arena has three entrances. The main entrance is located off 5th street. The main entrance features three stairways with grass in between each. This entrance contains the main box office and will call. From the outside you can see why the arena's nickname is "The Roundhouse" with its round shape. At night the arena has lights surrounding the whole top of the arena. 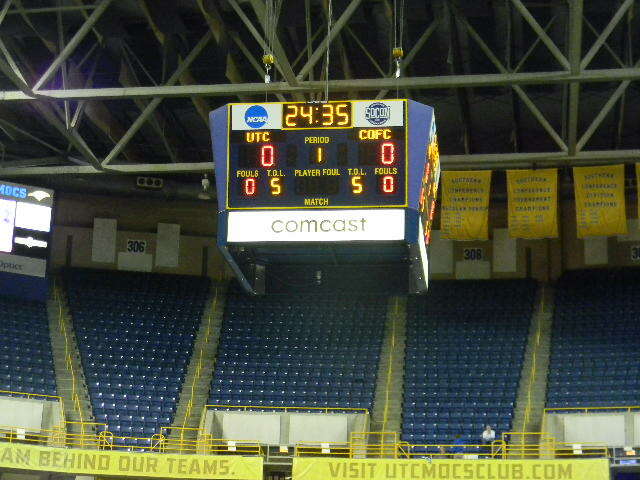 The arenas main entrance has "The McKenzie Arena," UTC Mocs, and the Moc logo in the windows. The court design features the "Power C" at mid-court. On the baseline they have Chattanooga with a blue background. The sidelines feature a Moc in a faded light blue color with a GoMocs hashtag on one end and GoMocs.com on the other. The arena has a center hung scoreboard. This scoreboard features the basics such as score, time, fouls, and timeouts. Two more scoreboards can be found in front of sections 205 and 219, with players number and points scored being its main feature. #1 Start your day at the Terminal Brewhouse located 14th and Market St. Grab a beer and plenty of great food options! 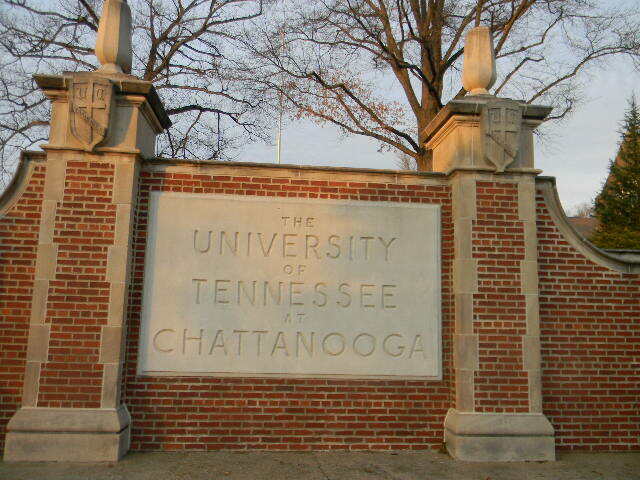 #2 If you want to see the UTC football stadium (Finely Stadium) it's less than a mile away from the Brewhouse. It's located on Carter St. and West 19th St.
#3 Head further downtown to the Riverfront District where several great amenities can be found. The Tennessee Aquarium, AT&T Park home of the Chattanooga Lockouts, Creative Discovery Museum, and many restaurants. If you don't see anything there head across Walnut St. Bridge, the world's largest pedestrian bridge, to the North Shore District. This district features local boutiques, restaurants, and several parks. #4 Take a walk around the UTC Campus. Check out the old home of the Mocs basketball team, Maclellan Gym. #5 Head to McKenzie Arena! McKenzie Arena: Overall McKenzie Arena has a great bones. The blue and yellow chairback seats are great and provide separation between the different sections of the arena. The entrance was nice and had great lighting. The size of the arena was great at a little over 10,000. I would like to see at least 10 suites in an arena of that size. The video boards were a nice size, but at some spots in the arena the view can be a little obstructed. 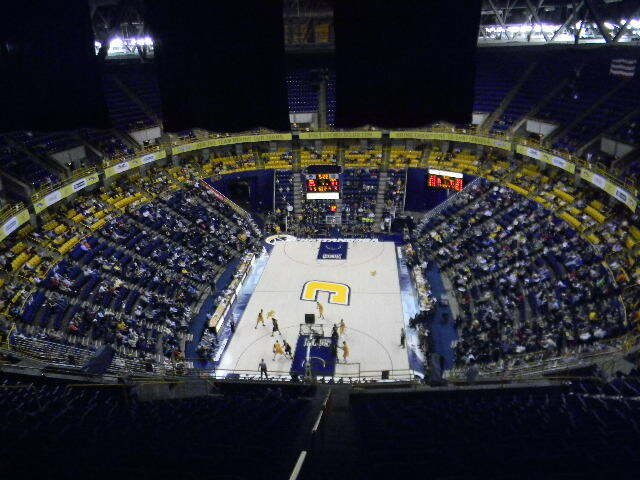 Since the upper level isn't filled to capacity as often I would spell out Go Mocs in the seats by changing the lettered seats, yellow. The center hung scoreboard serves it purpose, but could use an upgrade. A few people pointed out to me that the arena can't support a bigger center hung scoreboard, which is unfortunate. The banners for both the conference teams and Moc banners were a bit dated. The 100 section was a bit shaky due to the seats being retractable. I have a concern about the size of the concourse when the arena is near capacity. It isn't very wide and could use some sprucing up. The good news are major renovations will happen to the 100 level seating starting this summer and should be completed by the start of the 2013-14 basketball season. The arena has great potential and I'm interested to see how the new seating improves the venue. University of Chattanooga Campus: The campus is under a lot of construction due to the campuses master plan. The campus has a few buildings that give you a look at what the future holds for the UTC campus. The "ARC" is the campus aquatics and recreation center. This new aquatics facility includes a water slide, water basketball, water volleyball, and more. Having a water slide on campus is awesome. 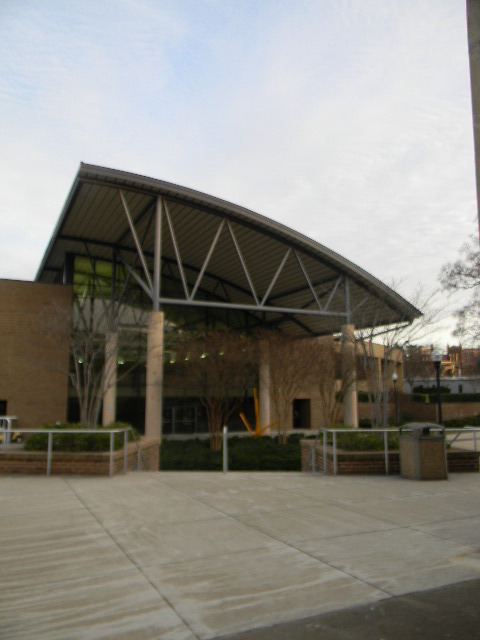 From 2002-2004 the University Center underwent a 17 million dollar renovation. The renovation brought about food options, bookstore, commons area, and many other nice features. The new library is under construction and gives the campus a more modern feel. This will be the focal point of the campus with the pedestrian mall being finished nearby. What I saw today will likely look much different in a year or two. The campus enrollment continues to rise and with more and more students coming to UTC the campus will continue to make improvements. I enjoyed the views of the mountains from the UTC campus, also. Chattanooga: I started of my day at the Terminal Brewhouse. The Terminal was once a hotel to the nearby train terminal. Now it's renovated and serving great food and brews! I had a Carnivore Sandwich and Belgian White to drink, highly recommend both. Next to the Terminal Brewhouse is the Chattanooga Terminal Station. The station is now a hotel with some of the rooms being in train cars! The hotel has many shops, restaurants, and one the largest model railroad systems in the world. Before you leave the area Finley stadium is located just a mile away on Carter Street and West 19th. From the terminal you can head down Market St. to the Riverfront district. You'll find the Tennessee Aquarium, museums, movie theater, plenty of restaurants, and AT&T Park. Crossing the river to the Northshore district is local shops, places to grab some beers, and Coolidge Park. In the park is a carousel. I wasn't able to take in all of what the city has to offer, but from what I saw, I was impressed. The city has plenty of things to keep you occupied for a weekend getaway. It's very scenic with the river and mountains in the background. I'm looking forward to another chance to see what Chattanooga has to offer. Atmosphere: The crowd was decent with an announced crowd of 4,487. I saw a fair amount of students in the student section, but only a handful standing in the front few rows. Students are key to a great atmosphere. The band was great. I felt a great vibe from the band and could tell they enjoy what they do. Court Design: I really liked the lite wood. The "Power C" is just the right size at mid-court. My only knock on the court design are the sidelines, they look faded and you can barely make out the Moc logo.